Fresh produce is full of flavor and adds an unparalleled quality to each meal, but how do you get that fresh flavor when key ingredients are out of season? 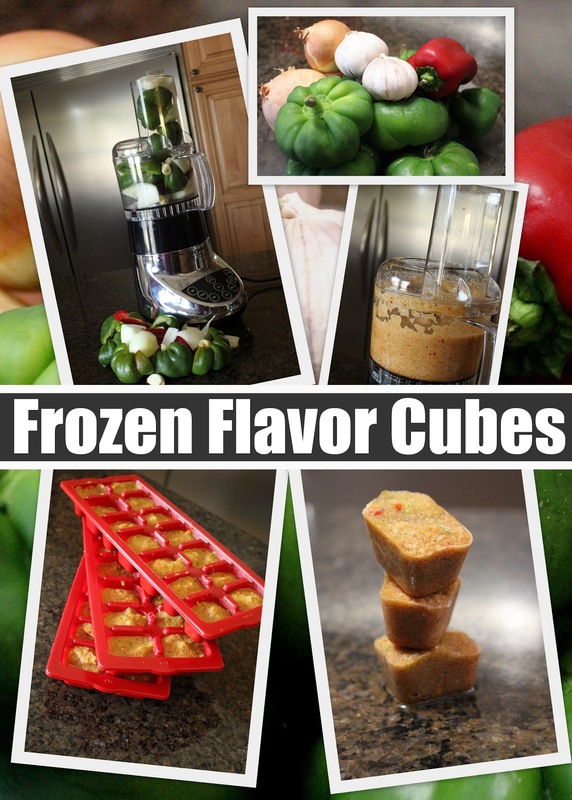 Frozen Flavor Cubes! I have to admit, this is not my idea. My wise (mother-like) friend, Doris taught me this when I was just a teenager, and I've used it ever since. This variety uses just 4 ingredients: Green Peppers, Red Pepper, Onions, and Garlic. Proportionately, you will want more green peppers than onions and garlic. You may want to experiment to find out just how much of each that you would like to use. Wash all of your veggies. Cut into pieces that will fit in your food processor (or you may be able to chop smaller and use your blender). Puree until all chunks are gone. Fill trays will the puree and freeze thoroughly. When they are frozen, remove them from the ice cube trays and into a freezer bag. When you want to add this to your meals, place in a pan on medium heat with a jot of olive oil. This will thaw quickly and then you can proceed to add your meat or veggies. You may choose to use this idea in many ways. By using this concept, you can create fruit flavored cubes (strawberries, blueberries, mango, etc.) that can be added to a dessert or a glass of water (for flavoring). You may want to add fresh herbs such as cilantro, basil or thyme. The possibilities are endless. Just think of the time you will save by having these beauties on hand when you need to turn out a quick meal! Have fun and let me know how your flavor cubes turn out!